A year ago, in the case brought by WSC, the Court of Justice of the European Union (CJEU) again ruled that Western Sahara is not part of Morocco and Morocco has no jurisdiction or sovereignty over the non-self-governing territory of Western Sahara. The CJEU made it clear that the people of Western Sahara must be regarded as a third party' and can only be affected by the implementation of EU-Morocco agreements if they have consented. Last week the European parliament approved the new EU-Morocco fisheries agreement (SFPA); last month the parliament approved the new EU-Morocco trade agreement. The European Commission had negotiated both these agreements to circumvent the ruling of the CJEU. These agreements now need to be challenged. Replying to the House of Commons European Scrutiny Committee, the Minister for Agriculture, Fisheries and Food (George Eustice MP), stated that the legality of the new agreements would only be determined by litigation. (See below). MINURSO remains the only modern UN Peacekeeping Mission without a Human Rights Mandate. In April the UN Security Council will be discussing, and then voting on, extending the MINURSO mandate. WSC will again be working with Western Sahara Action Forum (WSAF) to coordinate action calling on the UNSC to include human rights monitoring and protection for the Saharawi's resources in the MINURSO mandate. More about this and how you can help next month. Despite four consecutive rulings of the EU's highest Court calling such a practice illegal, the European Parliament voted for the EU-Morocco Fisheries Agreement that will be applied to the waters of occupied Western Sahara. On 12 February, the European Parliament gave its consent to a new Sustainable Fisheries Partnership Agreement (SFPA) with Morocco - one that will be carried out primarily outside of the internationally recognised borders of Morocco: in occupied Western Sahara. 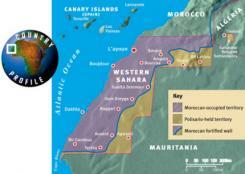 In February last year, in a case brought by WSC UK, the EU Court of Justice ruled that applying the EU's Fisheries Agreement with Morocco to the waters of Western Sahara was in violation of international law, in particular of the principle of self-determination. Pages 57-9. We note the Minister's response. While we consider that the question remains as to whether the consultation exercise undertaken to support these proposals on the FPA meet the underlying objections of the CJEU as regards respect for the self-determination of Western Sahara, we accept the Minister's contention that this will only be resolved by further litigation. In a letter to MEPs, the leading international human rights NGO highlights the need for an opinion of the EU Court of Justice on applying the EU-Morocco Fisheries Agreement to a territory that is under occupation. Human Rights Watch is adamant that international humanitarian law (IHL) must apply, as, they argue, "the relationship between Morocco and Western Sahara is also one of occupation". "In practice, in order for Morocco, as an occupying power, to lawfully exploit Western Sahara's resources, it would have to establish a fund with transparent bookkeeping that shows the resources utilized or exported, the revenue derived, and the channeling of those resources to the sole benefit of the people of Western Sahara". “As regards the expression waters falling within the … jurisdiction of the Kingdom of Morocco' in that provision, the Council and the Commission considered, among a number of possibilities, that the Kingdom of Morocco might be regarded as a de facto administrative power' or as an occupying power of the territory of Western Sahara and that such a description could be of relevance in order to determine the scope of the Fisheries Partnership Agreement [of May 22, 2006]. “The Court held that there was no point in considering whether either of these two frameworks, as an expression of the “joint intention of the parties” to the Fisheries Partnership Agreement … “would have been compatible with the rules of international law that are binding on the European Union” since “the Kingdom of Morocco has categorically denied that it is an occupying power or an administrative power with respect to the territory of Western Sahara….It follows from all the foregoing that the waters adjacent to the territory of Western Sahara are not covered by the expression waters falling within the sovereignty or jurisdiction of the Kingdom of Morocco', in Article 2(a) of the Fisheries Partnership Agreement” (Paragraphs 72 and 73). In its newly published Freedom in the World report Freedom House lists Western Sahara as the seventh most repressive human rights place on earth. Freedom House gives Western Sahara an aggregate score of four points in its 2019 annual freedom ranking - ranging from 0 (unfree) to 100 (free). To compare, the Gaza strip has an aggregate score of 11, and Russian-controlled Crimea scores 8. The territory of Western Sahara, under Moroccan occupation, thus ends up as an extreme outlier in the "not free" part of the spectrum. Only six countries and territories have worse aggregate figures: Syria (0 points), Tibet (1), South Sudan (2), Eritrea (2), Turkmenistan (2), North Korea (3) are rated worse. Is One of Africa's Oldest Conflicts Finally Nearing Its End? The 1951 Refugee Convention, signed and ratified by Spain in 1978, sets forward the right to seek international protection. The right to seek asylum is similarly stipulated in the Declaration of Human Rights Article 14, stating that “Everyone has the right to seek and to enjoy in other countries asylum from persecution”. Husein Bachir Brahim, a 27-year old Saharawi traveling to Spain seeking asylum, did not receive such international protection. He suffered the same fate as so many Saharawis before him have suffered: Collective deportations of Saharawis from Spain to the Occupying Power Morocco. Husein travelled from El Aaiún (the capital of Western Sahara) to Barranco Mulión in Las Palmas (Gran Canaria) on 11 January 2019 in a small boat. Upon arrival in Spain, he sought asylum on the grounds of political persecution, claiming that he was being persecuted by the Moroccan State and actively pursued by the Moroccan police in retaliation for his activities as a human rights defender, advocating for the independence of Western Sahara. Only ten days after having arrived in Spain, Husein was detained by the police in Lanzarote. Without being presented in front of a judge or any other judicial or administrative organ and despite having sought international protection Husein was deported to Morocco on 17 January 2019. Upon arrival in Morocco, Husein was immediately placed in handcuffs, arrested for his political and human rights activism, and imprisoned in Luidadya prison in Marrakech. A member of his family said to a representative of Adala UK, shortly after his arrest: “His request for asylum was never heard. He was ready to make his claim because he knew he was being pursued by the Moroccan police and they were going to lock him up”.